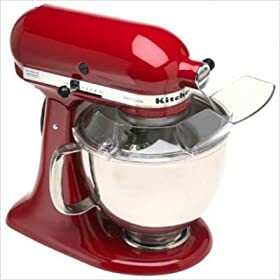 KSM150PSER -10-speed slide control ranges from a very fast whip to a very slow stir -Tilt-head design allows clear access to the beater and bowl -Flour Power - 9 Cups -Mixing bowl capacity - 5 Quart -Polished stainless steel bowl finish -Contoured bowl handle -Multi-purpose attachment hub -Planetary mixing action 67 Point -'C' dough hook kneads yeast dough for bread and pizza recipes -Direct drive transmission -All metal construction -One year warranty KitchenAid will replace it free of charge -325 Watts -Dimensions: 13.9''H x 8.7''W x 14.1''D Includes: -Flat Beater -'C' dough hook -Two Piece pouring shield w/ wide chute -5 Qt. Stainless Steel bowl w/handle -Wire whip This Artisan Series model features a tilt-head mixer designed to give you easy access to the bowl and beaters. The 'C' dough hook kneads yeast dough for those bread and pizza recipes you've always wanted to try. With its all metal construction, contoured bowl handle, and polished stainless steel bowl finish this stand mixer is durable yet stylish. It is sure to become an asset in any kitchen. Available in Black, White, Gray, Red, Blue, or Almond Cream.